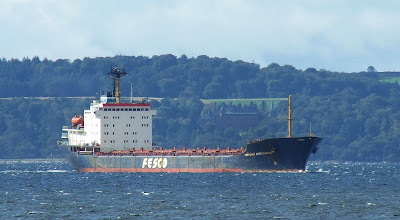 Having only visited Hunterston two weeks ago, the Russian bulk carrier GRIGORIY ALEKSANDROV returned to the Ayrshire port this afternoon, bringing in a second cargo of coal from the Russian port of Vystotsk, close to the Finnish border. Completed in 1986 at the Georgi Dimitrov Shipyard at Varna, in Bulgaria, she is 184.62 metres long, and has a deadweight of 24,105 tonnes. GRIGORIY ALEKSANDROV is operated by Russia's third largest shipowner, the Far-Eastern Shipping Company. Mount Stuart house on the island of Bute is visible in the background as the bulk carrier rounds the northern end of Great Cumbrae before heading south past Largs.